Our dynamic English curriculum provides pupils with transferable skills and fosters a love of literature from an early age. It is appropriate that our library sits at the heart of the school as we believe that reading is fundamental to all learning. The children are exposed to a wide range of authors and are encouraged to read regularly, both in school and at home, to stimulate their imagination and expand their vocabulary. We recognise the centrality of the English language across the curriculum and the importance of pupils being able to write and express themselves fluently, gradually becoming attentive to nuances and tone in both written and spoken communication. In Lower School, a range of short stories, picture books, poetry and role-play are used to engage and facilitate the emergence of early writers. 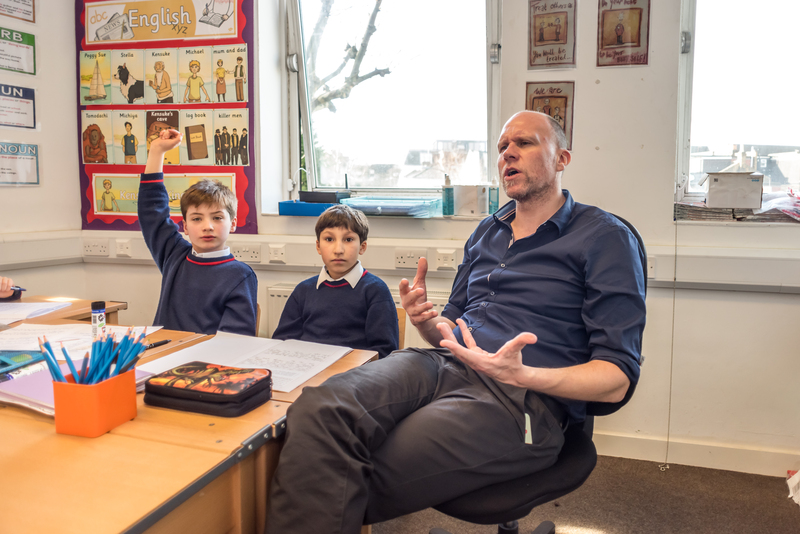 English teachers seek to harness the creativity of their pupils and develop a deep love of literature, whilst providing the necessary foundations for success in Upper School. Phonics, handwriting and spelling are also taught as distinct lessons. In Upper School, the children study a carefully selected novel each term, using a range of techniques including the Royal Shakespeare Company's ‘drama for writing’ model. The novel acts as both a stimulus and high-quality model from which creative writing and comprehension are taught. Emphasis is placed on each child developing coherence and vivacity in their writing, whilst still improving their syntax, punctuation and spelling. Thorough preparation for 11+ English examinations starts in Year 5, with gentle preparation in Years 3 and 4. By the end of January of Year 6, the children are confident with the requirements of the creative writing and comprehension papers and with a range of examination techniques.